Thank you all for another great hunt! Thank you all for a fantastic hunt! A special thanks to our businesses who stayed open and participated: Jimmy Cameron, Village Treats, Nanny Goat Alley, Sweet Mabel's, The Greeks, The Great American Pub, McShea's, Swan Dance wear and the Tickles. 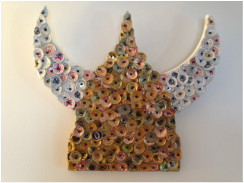 Someone took home the Viking Helmet bottle-cap art that we collectively created in the 2014 Hunt. The piece was auctioned at Sweet Mabel, and all proceeds went to N.I.C.E.